This week I was over at a photo studio and one of their new long-term off-line storage drives, a brand new Western Digital 750 GB drive in an external case, massively failed for no apparent reason. We didn’t have a lot of data on it yet, probably only 100 gigs or so, but the thought of losing that drive didn’t sit well with me. I immediately pulled out DiskWarrior and was informed that the drive was too damaged (fsck claimed it was a “bad super block: wrong magic number”). Nothing I tried would get a result short of reformatting, which I didn’t want to do since as far as I knew, nothing wrong had actually happened. So I sent off a quick note to Alsoft asking for advice. I was very surprised, and impressed, when I got note back from Marc telling me to IM him with some details and he’d try to help out! I got online and we tried a few different approaches through DW and the command line and after about an hour we were able to make a full recovery of our photo data on that drive! Amazing. Alsoft went above and beyond this week and the studio was most grateful. WD, on the other hand, is now on my short list of drive makers to think hard about before purchasing. We’ll see how they handle the return/claim on this bad drive. 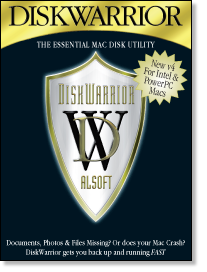 Huge thanks to Marc @ Alsoft and DiskWarrior! Go buy yourself a copy if you don’t already have it!